Interestingly, after I wrote about my mini library cluttering my table by my bed, Shonda tagged me for a book meme. I love books, and like songs, struggle to pick just one. You’ll notice there is very little fiction in my reading. I don’t know what it is (perhaps the long, drawn out descriptive narratives) but I don’t have the patience (intelligence) to enjoy (endure) too many fictitious accounts. This one requires a bag of m & ms from one of the kids’ stockings that they left downstairs to type this out. Okay, I’m all set. First of all, (don’t you love first of all in the middle of a post?) for the sake of avoiding repetition and keeping this interesting, I’ll add a qualifier to most of these questions and say, “Besides the Bible, ___. 1. One book that changed your life. Books changed my life, but I was not always a reader. I only became an avid reader when I sought God on a deeper level, so most of my reading is either biographical or spiritual. If I must choose just one, one book that changed my life was Pilgrim’s Progress by John Bunyan. It changed me into a reader. (Oh, I can’t. I have to add more.) C.S. Lewis’s writings changed me into a thinker. And anything by John Piper challenges my spiritual staleness. 2. One book that you’ve read more than once. A very sweet book with a profound message is Gift from the Sea by Anne Morrow Lindbergh. I find it necessary to read this book at least once every two or three years and find it takes on new dimension with each reading. It’s definitely a woman thing, though. 3. One book you’d want on a desert island. If I were on a desert island or deserted island, or most especially a deserted desert island, I wouldn’t need a book, honey. I’d need a rescue. Maybe you saw my Survivor account. 4. One book that made you laugh. I would have to agree with Shonda and go with Erma Bombeck, but my favorite of hers was Life is always Greener over the Septic Tank. And I enjoyed Bill Cosby on Fatherhood. There are not enough funny books written! I miss Erma. 5. One book that made you cry. I love books that touch my soul. One that left its mark was Anne Frank’s Diary. Of course, The Hiding Place by Corrie ten Boom is an all-time favorite. Wuthering Heights made me cry. A Child Called It by Dave Pelzer breaks my heart about a child enduring childhood abuse. Here I go. “Nobody can eat just one.” Where are those m & ms? And while we’re at it, I could use a Kleenex. 6. One book that you wish had been written. God’s Phone Number would be helpful, The Answer to Your Question Is would intrigue me right from start,and a bestseller would be How to Listen so God will Talk. I gave up on the “one book” qualifier after question 3 because it was a stumbling block. And the m & ms are all gone. 7. One book that you wish had never been written. I don’t know. Maybe everything by Michael Moore. Now there’s an M&M for you. Talk about a pop culture icon that gets recognized by griping about everything. It kills me that he has become so celebritized. Need some proof? Who else gets 239,000 hits when you Google “Why I hate Michael Moore?” Or maybe If I Did It by O.J. Simpson because his name became synonymous with “Ojaying” your wife in domestic violence. Enough said. 9. One book you’ve been meaning to read. The Mitford series by Jan Karon. I just can’t get past the first pages of a single Episcopalian priest and his labrador retriever ever at his side before I fall asleep. Please don’t hate me. I know they’re sweet books, but so far, I snooze before the second chapter. 10. Tag 5 people. Five? Hmmmm. I can’t “tag” Kathy because she’s been so busy remodeling and waiting on that precious grandchild to arrive, and hasn’t updated her blog since early December—miss you Kathy. I could tag Shonda, who I got the meme from in the first place, but that would cause the meme to fall into a centrifugal spin on itself, so that isn’t a good idea. I can’t tag Angie or Fran or Karen since they were tagged already. I can’t tag Jean or Barbara because they don’t blog, but surely leave sweet comments sometimes. (Maybe you’d like to use the comment section on what you’re reading.) I know everyone is busy right now, but I’d love to know what Bev or Jean Mac or Linda are reading. So if these questions interest you then by all means: Go for it. 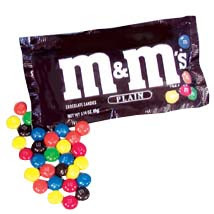 And I challenge you, like m & ms–can you really just name (or eat) one? I am now reading “A Christmas Promise” (Thomas Kinkade & Katherine Spencer)Just finished “Memoirs of a Geisha”. My bedstand always has poetry, my Bible and inspirational books. OK, since I’m not an official blogger, don’t know if I’m allowed to do this or not, but sorry, just can’t resist! 3. The Pursuit of God…. 5. The Pursuit of God…. 6. I Finally Got the Surrender Thing. 7. Don’t really know….I’ve read several I wish I “had never read” but can’t think of the names of them right now! Why did I read them? Promised my FIL I would! 9. Heaven by Randy Alcorn….started it, but never finished it….will do so in 2008. Oh, goodness, my list could go on and on with the books I’ve read that changed my life or I’ve read more than once, But The Pursuit of God filled #’s 1,2,3, and 5 to a “t” and was the book that started me on my pilgrimage of reading the deeper books. Hope I didn’t violate any rules by posting this and making it so long! Love you, Annie. I’m off to find some M&M’s! II Cor 2:14 – they were chained to the chariot in those days…the martyrs, that is, would be carried through the streets in a processional chained to the chariot and the fragrance of Christ lifted off of them…because you are chained to HIM, I smell that fragrance of Christ on you that is so powerful…currently I am reading Henri Nouwen – he so brings me to my God!